Rebecca Sapp/WireImageDisco great Thelma Houston won a Grammy Award in 1978 in the Best R&B Vocal Performance — Female category for her chart-topping hit “Don’t Leave Me This Way,” but her trophy was broken in a 1994 earthquake. 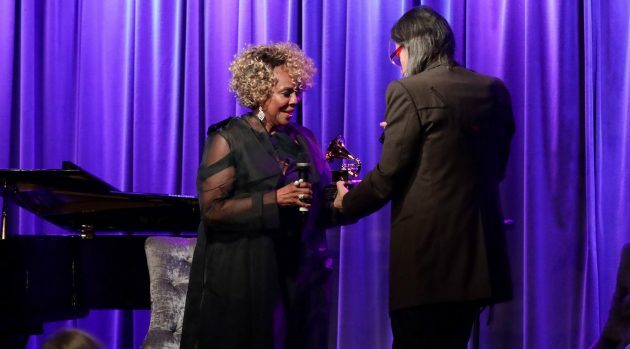 On Thursday, Houston was presented with a brand-new statuette at a special interview and performance event at the Grammy Museum at L.A. Live in Los Angeles, Billboard reports. In order to receive the new trophy, Thelma had to give back the broken one, something she said she found difficult to do. In February, the 72-year-old singer will take part in the star-studded Ultimate Disco Cruise 2019, and she also has several concerts on her tour itinerary. Visit ThelmaHouston.com to check out her full schedule.